This is very similar to many of the liberals that I encounter at work. Their work ethic, punctuality and concern for their co-workers is non-existent because they’re busy worrying about themselves. 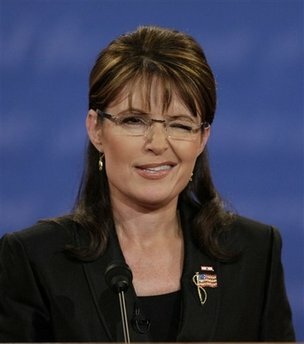 You’ve got to give Palin a lot of credit for having the courage to go on a show where she doesn’t have very many fans. Not only did she hold her own, but she looked like she had a great time. I would’ve liked to see her do her own rap though! That witch Tina Fey probably requested to not be in a sketch with her. You gotta love that liberal tolerance. 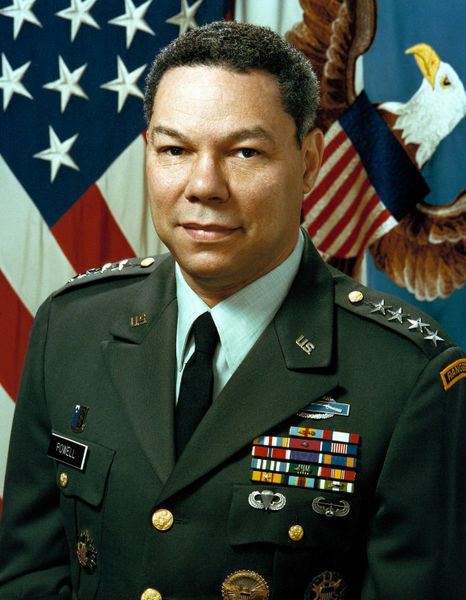 Say it ain’t so, General! It couldn’t be for these 2 reasons, could it? Revenge for Bush misleading on him about Iraq. They share the same skin color. After enduring weeks of gotcha questions and condescension from the so-called “Mainstream Media” (they aren’t mainstream, they’re leftists-when are we going to strip that title from them? ), Sarah Palin disappointed them all by holding her own against Joe “The Gaffe Machine” Biden at Thursday’s Vice Presidential Debate. If you watched the coverage on MSNBC and listened to Chris Matthews, Keith Olbermann and David Gregory, you might think that Biden won. I tune in to those guys for about 5 minutes just to hear what they’re saying. Then I always end up turning the channel in disgust after watching them bash the Republicans while feigning “objectivity”. Peggy Noonan to counter those 5 from the right. 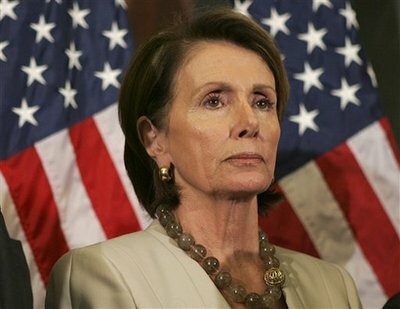 In this episode of liberal hipocrisy, Speaker of the House Nancy Pelosi pays her husband with funds from her PAC. Over the last 10 years, she has paid her husband’s real estate and investment firm almost $100,000. The problem: Last year this lunatic supported a bill that would have banned members of Congress from putting spouses on their campaign staffs. The bill banned payments by campaigns and PACs to spouses. Her comment at the time, while denouncing the Republican “Culture of Corruption” was: “Democrats are committed to reforming the way Washington does business”. Except when it comes to her family business. Then she doesn’t seem to have a problem with it. McCain took the fight right to Obama, and won. Although Lehrer and Obama attempted to make this National Security debate more about the economy, McCain effectively highlighted Obama’s wrong economic policies and escaped major damage. 1. He wouldn’t even look at Obama during the debate. He gave him about as much respect as he would Mahmoud Ahmedinejad. 2. McCain’s line: “Senator Obama just doesn’t get it” was very effective in making Obama look inexperienced and out of touch. 3. Obama agreed with McCain on a number of occasions. This made him look weak. McCain’s campaign had a commercial out immediately highlighting this. 4. Obama looked like a frustrated student at times, raising his hand and hoping the teacher would call on him. Lehrer wouldn’t bail him out, and McCain kept on rolling with his points. 5. Obama was visibly frustrated on many occasions. He looked angry at points, and had a strange grin at others. 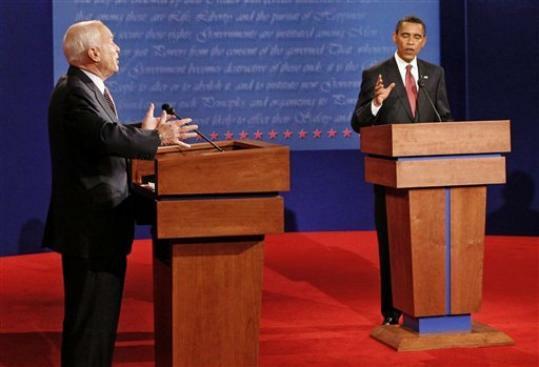 Now I can’t wait for this Thursday’s debate between Palin and Biden. This is gonna be great. The over/under on Biden gaffes is 3. 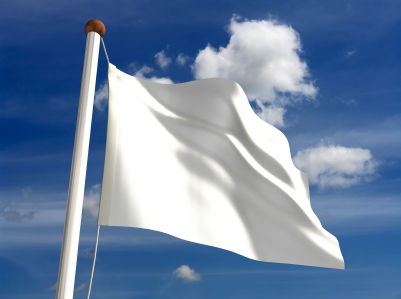 We have officially waved the white flag of surrender. Iran has won. They will acquire a nuclear bomb. The United States has refused to give Israel a green light to attack Iran and stop their nuclear program. Even though Iran’s President Ahmadinejad has said that Israel should be wiped off the map (not just rhetoric, he means it literally), we don’t do anything to stop him. 1. Elect John McCain and maybe he’ll reverse Bush’s policy of inaction. 2. Hopefully Israel will strike anyway, without our permission. I’m not too optimistic about either one.